Several lines of evidence including human and rodent sleep studies with receptor ligands, data from genetically modified mice, and the localization of receptors in key brain structures suggest the important role of 5-HT2 receptors in the regulation of vigilance. There are three members of the 5-HT2 receptor family: the 5-HT2A, 5-HT2B and 5-HT2C receptors. Their distribution in the brain as well as their functions in sleep regulation show considerable differences. In summary, activation of 5-HT2A receptors results in an increase, and activation of 5-HT2B receptors causes a decrease in waking. Tonic activation of 5-HT2A receptors by endogenous 5-HT effectively inhibits slow wave sleep. Subtype-selective 5-HT2C receptor agonists cause an increase in waking, while the 5-HT2C receptor antagonists have little effect. 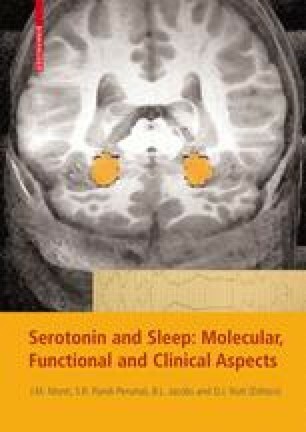 In the case of none subtype-selective compounds, the 5-HT2A receptor-mediated effects usually dominate the outcome on sleep-wake stages and thus, inhibition of non-REM (and also REM) sleep could be expected after administration of selective serotonin reuptake inhibitor antidepressants, while activation of slow-wave sleep could be observed after 5-HT2 receptor antagonist antidepressants and atypical antipsychotic compounds, although high affinity to other, e.g., cholinergic or adrenergic receptors may mask the outcome in certain cases. Compounds with high affinity to 5-HT2 receptors (either agonists or antagonists) reduce REM sleep in general.